All of April is celebrated as Jazz Appreciation Month, which this year also includes a Jazz Day (April 13) and an International Jazz Day (April 30th). 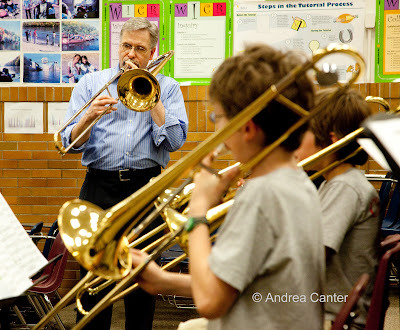 I’m not sure if within the month there is a day particularly set aside to honor jazz educators, but there should be. 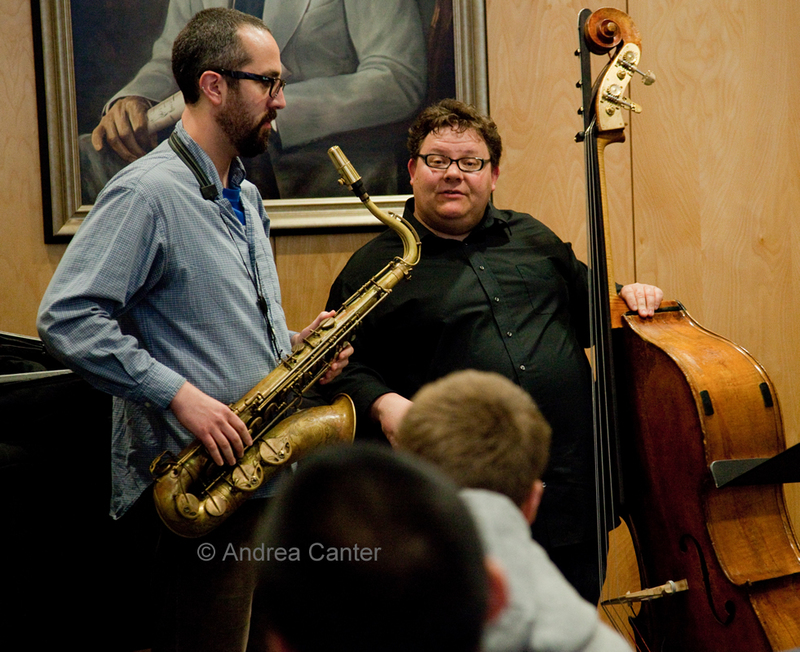 So I will declare my own “JazzINK Jazz Educator Appreciation Day.” A day is hardly enough. How could we sustain a month-long celebration without those individuals dedicated to passing on the tradition and stimulating the future of the music? How could we sustain the music at all? I am not using a narrow definition of “jazz educator” here. Indeed, there’s a growing corps of individuals who have degrees not only in jazz performance but in pedagogy as well, who serve on college and conservatory faculties or in the trenches of public and private schools as jazz band directors, who teach privately or through community programs. But there are the many jazz musicians out there who “pass it on” on the bandstand, offering experience and wisdom “on the job.” The jazz academies of the streets were of course the primary centers of jazz education for much of the last century. Some of those academies, run by the likes of Joe Oliver, Art Blakey and Dizzy Gillespie, granted “degrees” to the most acclaimed performers in jazz history. And that in vivo schooling continues today, with such deans as Roy Haynes and Charles Lloyd. Within the past few days I have had the opportunity to observe a wide swath of the jazz education available to middle and high school students in our local community…and somewhat beyond. On Saturday, jazz band students from three St. Paul schools gathered for their second annual “St Paul Schools Jazz Festival,” held at Ramsey Junior High under the leadership of Ramsey’s jazz director, Diane Sollenberger. For a few hours, about 60 middle and senior high students attended two rounds of clinics with six of the area’s finest performing clinicians. First round, each school jazz band played for, and was critiqued by, a pair of clinicians, spending the majority of time trying out some new ideas to refine their sound, their interactions. The school band directors served both as co-teachers and learners. Second round, students across schools participated in one of six clinics for like-instruments: saxophones (led by Amber Woodhouse), trumpets (Adam Meckler), trombones (Dave Graf), pianos (Laura Caviani), drums (Peter Leggett) and strings (Chris Bates). 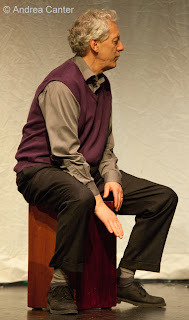 Each clinician had his or her own approach, own message to deliver through interactions and demonstration, ranging from learning tunes via listening and singing back; using different scales to create different moods; mastering different chord patterns; strategies for note selection, etc. These clinics were more hands-on with no more than a dozen students in each section. The final hour of the day was a mini-concert for family and friends as each school band came back together to perform two tunes. The clinicians, each of whom has career as a performer, came together as well to form a swinging sextet—they had played one tune to kick off the festival and then another to close it out. It was hard to tell who was more enthused by day’s end, the students or their teachers… or their families. There was a lot of learning and a lot of fun, always a formula for success. And mixing middle and senior high students similarly seemed to be a boon to all. 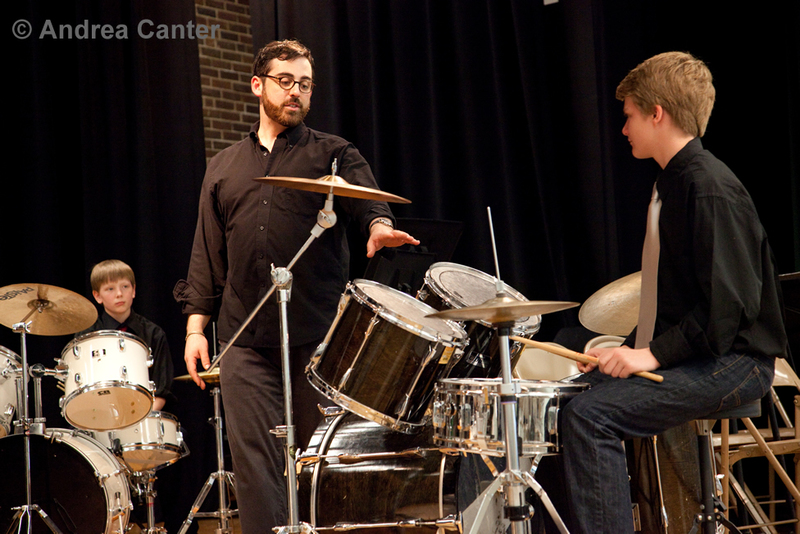 A day later, MacPhail Center for Music held its first-ever “Combo Festival,” an invitational gathering for high school-based small ensembles. The area boasts a lot of opportunities for big bands, particularly large festival events each winter in Roseville, Duluth, LaCrosse and Eau Claire, and to some extent these events also provide opportunities for smaller combos. But MacPhail wanted to host an event specifically focused on combos, which tend to get lost in the shuffle of limited band schedules and resources. In the end, some scheduling conflicts yielded a smaller pool of combos, but for the three ensembles who participated, the afternoon sessions provided some unique learning opportunities, again bringing well known performers into the “classrooms.” Each combo played a couple tunes for alternating pairs of adjudicators, drawn from the MacPhail Jazz Faculty (event coordinator Adam Linz, Chris Thomson, Greg Keel, Bryan Nichols, Phil Hey, JT Bates) and special guest artist, saxophonist Adam Niewood. 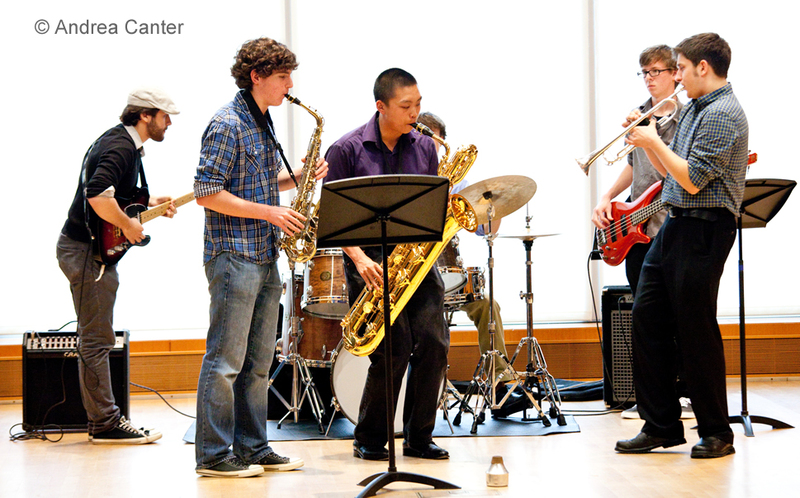 Following their combo’s performance, students received immediate feedback and suggestions from the clinicians, along with demonstrations and opportunities to try out new ideas. While one combo attended the critique session, students in the other combos attended a series of clinics addressing technique, repertoire, interaction, practice and more. Perhaps the most intriguing moments of jazz instruction came, appropriately enough, during the MacPhail Music Matters Luncheon yesterday, an annual event drawing nearly 1000 current and potential donors. In addition to performances by various MacPhail student ensembles (from jazz to gospel to Suzuki) and presentations about the school’s activities to bring music into the daily lives of thousands, one segment of the program addressed MacPhail’s new distance learning program. As we finished our lunch, saxophone instructor Greg Keel (visible via large screens at each corner of the ballroom) listened to and consulted with the jazz band at Kerkoven High School in central Minnesota – some hundred or more miles away, connected via Skype and internet. This year, Keel has been their guest clinician, collaborating with Kerkoven’s band teacher to develop a strong jazz ensemble. Yesterday, the topic was listening to phrases and singing them back to help internalize the melodic and rhythmic patterns. And everyone in Convention Center Ballroom A got to hear the results…. And the students got to hear the applause. From Minneapolis to Kerkoven, jazz artists are passing it on in real time. On Sunday (April 22nd), at the Dakota Foundation for Jazz Education fundraiser at the Dakota Jazz Club, one of these devoted musicians will be honored as the Jane Matteson Outstanding Jazz Educator. We’ll salute Keith Liuzzi, long-time jazz band director at Southwest High School. Tickets for the event, which will include performances by veteran sax man Dave Karr and the student ensemble, the Dakota Combo, as well as some inspiring words from young pro saxophonist Grace Kelly, are still available (www.dfje.org). The benefit will raise funds to support the Dakota Combo, summer jazz festival Youth Stages, scholarships to jazz camps, and a variety of projects that bring jazz artists into area schools…. to pass it on. So happy JazzINK Jazz Educator Day. Month. All year. To everyone who keeps the music alive by nurturing the next generation. On the bandstand, in the classroom, at a fund raiser. Or via Skype. Clinicians for the St Paul Jazz Festival and MacPhail Combo Festival were supported in part through the Jazz Artists in the Schools project of the Dakota Foundation for Jazz Education via a grant from the Metropolitan Regional Arts Council (MRAC) which is funded, in part, by the Minnesota Legacy and Heritage Fund.